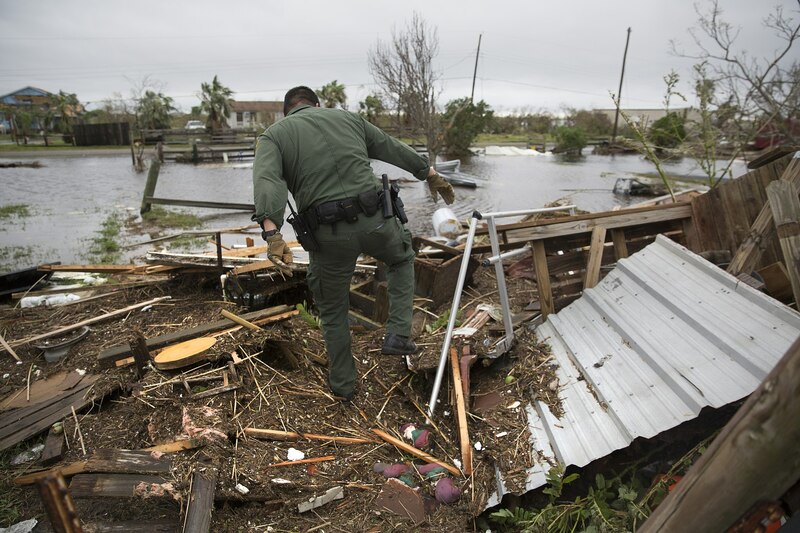 A U.S Border Patrol agent searches for survivors in the wake of Hurricane Harvey at Rockport, near Corpus Christi. The U.S. government urgently needs to do more to protect Americans from the worst impacts of climate change by preparing both people and infrastructure to better withstand hurricanes, floods and rises in sea level, experts say. Last year, about 90 people died and more than 185,000 homes were damaged or destroyed when Hurricane Harvey hit the United States. In all, more than 350 people died from wild weather in 2017, including wildfires, floods and cyclones. “This is our new normal,” Joel Neimeyer, federal co-chair of the Denali Commission, a government agency which provides Alaska with economic and infrastructure support, told the Thomson Reuters Foundation. Talk of using federal funds to better prepare communities for wild weather has been ongoing since Superstorm Sandy hit in 2012. The government spent more than $50 billion repairing homes, businesses and public transport and in disaster relief. Hurricanes Harvey, Maria, and Irma, wildfires and other weather disasters cost the United States a record $306 billion in 2017, the third-warmest year on record, according to the National Oceanic and Atmospheric Administration. And extreme weather is expected to become more common in upcoming decades, says the government’s National Climate Assessment. Heavy downpours have become more frequent since the 1980s and U.S. average temperatures have risen by 1.3 degrees F (0.72 degrees C) since 1895, according to the Climate Assessment. Warmer ocean surface temperatures and rising sea levels are the powerhouses behind big weather events, making it more likely for hurricanes to form and strengthen, and inflict more damage on communities. “We cannot wait a decade” for changes in government polices to occur, because these damaging weather events are becoming more and more frequent, F. Stuart Chapin, professor at the University of Alaska’s Institute of Arctic Biology, said in an interview. Government agencies must come together to help communities prepare for wild weather, he said. Harbors, bridges, power plants and other infrastructure also need better protection from extreme weather in vulnerable states, such as California, Alaska and Texas. “Generally, these infrastructure systems are not designed to account for a changing climate,” said Bilal Ayyub, professor of engineering at the University of Maryland. Roads, sewer systems and train routes across the country are likely to suffer as the climate changes, according to the U.S Government Accountability Office, an agency that works for Congress. U.S. buildings are only designed to last between 50 and 100 years, but many are used for much longer, increasing their vulnerability to extreme weather, according to Ayyub. The American Society of Civil Engineers is finalizing a manual to help engineers and planners build infrastructure that is more resilient to changes in climate. “Enhancing planning and policies related to land use and adoption of forward-looking building standards are essential strategies to prepare for weather extremes,” Ayyub said.